In October of 2012 I had my blood tested by IGeneX in Palo Alto, CA to see if I had Lyme Disease. The four pages of the test are below. The results were not easy for me to read. The lab said that my IFA (Lyme Immunofluorescence Assay - it detects antibodies against B. burgdorferi) was less than 40 for B burgdorferi (the Lyme spirochete/bacteria). Which would mean that I have low/no antibodies fighting Lyme. And yet the IgM of Western Blot (page 2 of the test) had a positive result, because more than two starred bands are present. A positive result suggests exposure to B burgdorferi. By CDC/NYS criteria, IgM WB is reported positive if two of the following bands are present: 23-25, 39, 41kDa. My test showed all of those bands as either IND, or indeterminate, or positive. My holistic, Lyme-aware doctor said that there was no question that I'd been exposed to Lyme. And that since the 31 band was indeterminate (page 2), I could do the 31 Epitope test. I opted not to because of cost, and because to me this test looks positive, and is enough for me to treat myself for Lyme. And re: the 41 band, which I tested as very positive to, is the flagellin protein of all spirochetes; this is usually the first to appear after a spirochete infection but is not specific to Lyme (for example, it could refer to syphillis or a dental pathogen). If you haven't seen it, this is what spirochetes look like exiting my red blood cells and swimming around in serum. I know that non-Lyme Literate MD's think of IND as a negative, but my understanding is that since something showed up in the IND bands, it is more likely a weak positive. So it is true that most LLMD's consider a band that is IND a positive. I am not in my element discussing this particular testing technology, as I've just recently started to learn about Lyme - or should I more accurately say, tick-borne infection. Because there are so many co-infections in addition/instead of B burgdorferi, and it's the burgdorferi only that is technically Lyme, we should be calling this illness a tick-borne infection. I am not yet ready to share what natural treatment I am using, because I'd like to see what happens in the months ahead. I know it is a long road, but I am not worried. I know everything will be alright. As I learn more through my own experience, I will surely share. I can say this though: detoxification is absolutely crucial to not feeling awful with this kind of situation (or any other health issue). Green food supplements, saunas, heavy metal elimination (embarked upon carefully and slowly), coffee enemas, lots of rest and clean spring water to drink, magnesium, herbs that encourage elimination, homemade cultured vegetables, lots of sea salt, trace minerals, epsom salt baths...you get the idea. I've also learned that some people who are newly diagnosed/infected with Lyme can get better with a course of antibiotics. In fact I have a friend who came down with horrible muscle pain and very high fever for which she had to be admitted to the hospital. After 24 hours of Doxy she felt her old self again. The doctors were never clear on whether she had had lymes or just ehrlichiosis, a common Lyme co-infection. However, despite some successes, many practitioners think that antibiotics can cause the spirochete bacteria to morph - into cysts or cell wall-deficient or other forms - and hide from the drugs, and, even worse, the immune system. These bacteria appear very tricky and evasive indeed. 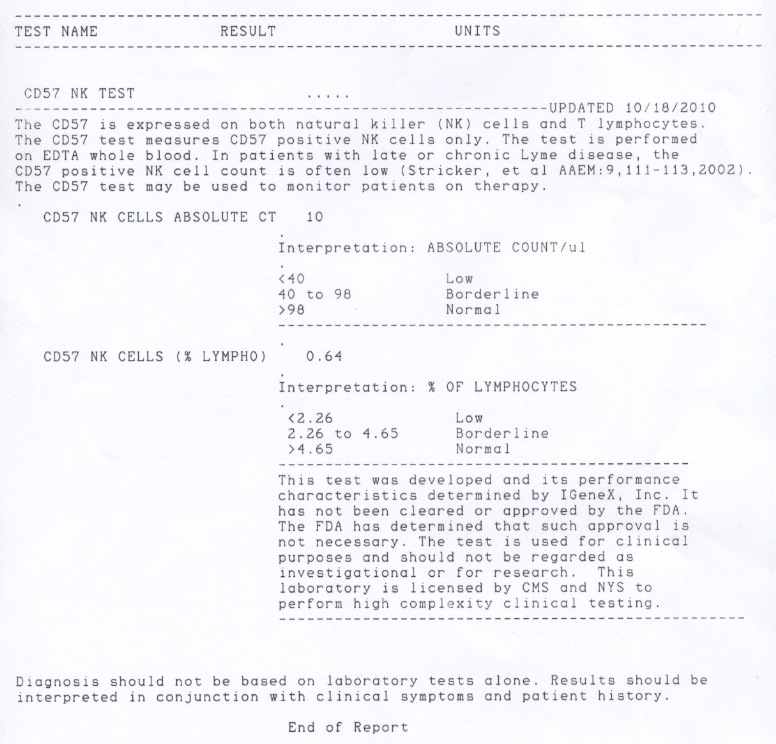 Page 4 of my test shows the CD57 NK Test result. It was EXTREMELY low. So low that my first thought was "Wow, this is serious!" Our ability to measure CD-57 counts represents a breakthrough in Chronic Lyme Disease treatment. It can be used to help determine how active the infection is, how well the treatment is working, and whether, after treatment ends, a relapse is likely to occur! This is how it works: Chronic Lyme infections are known to suppress the immune system. The Lyme spirochete can affect all major cell types of the immune system, but it most clearly can impact a specific subset of the natural killer cells. This is called the CD-57 subset. Just as in HIV infection, which suppresses T-cell counts, Lyme suppresses Natural killer cell count such as CD57. As in HIV infection, where abnormally low T-cell counts are routinely used as a marker of how active the infection is, in Lyme we can use the CD-57 count to indicate how active the Lyme infection is. When Lyme is active, the CD-57 count is suppressed. We currently are having our tests run by LabCorp because published research on this test was based on their methods. At this lab, the expected range for the CD 57 count is above 60. However, in the chronic Lyme patient, CD-57 counts are usually well below 60 and may be at risk with levels of 60-100. This test can be run at the start of therapy, then every several months to document the effectiveness of treatment. One hopes to see a stable number or a rising trend over time. When antibiotic therapy is finally at an end, if the CD-57 count is not above 60, then a Lyme relapse is more likely to occur. Test interpretation: Low CD57 occurs in chronic Lyme or when the disease has been active for over 1 year. A review of the affects of other infections, only Lyme spirochetes lowers the CD57. Following is the criteria established by research. Test interpretation: Low CD57 occurs in chronic Lyme or when the disease has been active for over 1 year. The count reflects the degree of infection. It is not a diagnostic test but is used as a marker for Lyme being active. Test done by LabCorp. My CD57 score was 10. As far as I know, this indicates that my body's been battling an infection(s) for a long, long time. I truly believe that if I had not have been detoxing all of these years, getting lots of waste out (from ever-present, multiplying pathogenic organisms) on a daily basis, I would be beyond dire straights. But I am not one for the conventional route, as you may have guessed by now. I don't take the drugs that conventional doctors have suggested for me. Instead, I learn, learn, learn, learn. And write a health website. What has your Igenex lab test told you? What symptoms do you equate with your tick-borne infection? By the way, I never got a rash. But last summer I did have two ticks on my skin that I needed to pry off. Did you feel better on antibiotics initially, only to find symptoms returning months later? We would all love to know.